I have been training for my new job here in Haiti. It's so different from the village nursing i was doing before-but change is a good thing and I am still working with the Haitian people i have come to love. Now I am meeting different Haitians in the over crowded city of Port au Prince and starting to build new relationships. Last week I went to the American Embassy for the first time. Angel Missions was requesting 3 medical visas for children who needed to go to the states for surgery. All 3 were approved! One of them is a little girl who is about 6 years and was born without a right leg. 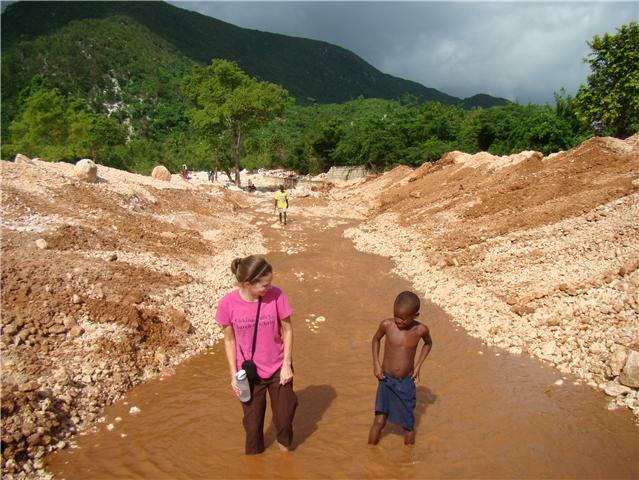 Before the earthquake she was getting physical therapy and prostesis fittings at a hospital here in Haiti. That facility fell in the earthquake and the services she needs are not offered anywhere else here in Haiti. Another one of the kids is a newborn with hydrocephalus who has been in and out of the hospital here in Haiti for most of his life. He will go to get shunt surgery and then return to the orphanage where he is living. Another is a 3 or 4 yr old boy with Cerebral Palsy. He needs extensive Physical Therapy work up and braces fit for his legs b/c he doesn't walk yet. He is absolutely adorable with the longest eye lashes i have ever seen! Pease pray for these children. Thank God for the opportunity for them to go to a country with great medical care. Pray for their biological parents as they wait here in Haiti the several months their children will be gone. Pray for the host families in the states to be a loving surrogate family until the children are reunited with their families in Haiti. I am truly thankful God put me in a place to be able to help these children. Hi Ginny - It's Deana from Indiana (and the April mission trip). Any chance for Nadine in Peredo to get a visa? I pray for her all the time. Do you know how she is doing? Are you teaching these people who can't afford children how to prevent pregnancy?